Last year, a new English-Japanese dictionary was released in Japan for Japanese people learning English. This may not seem very special until you hear the title: Star Wars English-Japanese Dictionary for Padawan Learners. Does this sound as awesome or what? I’m totally jealous of Japanese people who get language study tools based on Star Wars! The dictionary is essentially a list of words that are used in the original Star Wars Trilogy. Readers are given lines of dialogue using target words so they can practice speaking like Star Wars characters. The problem is that we, English speakers learning Japanese, don’t have anything similar. Why do Japanese people get all of these wonderful study guides while we’re stuck with boring dictionaries and textbooks? 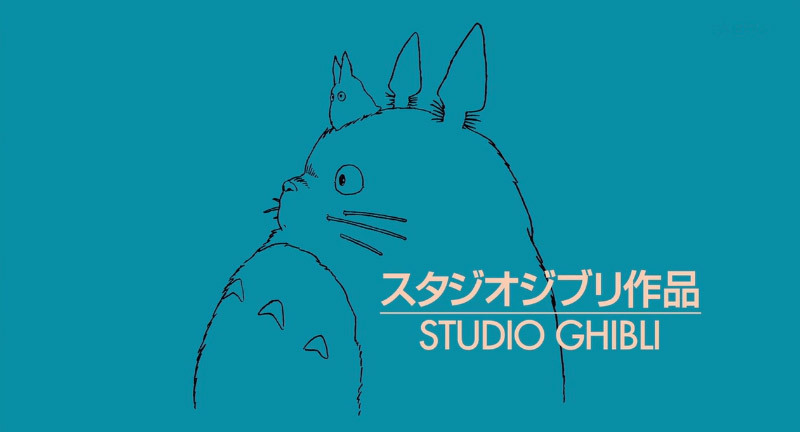 This is why I have constructed a new type of Japanese study guide that helps English speakers study Japanese with the help of movies better than Star Wars: The films of Studio Ghibli! Studying alongside these wonderful films will hopefully bring fun to the learning process and warm your heart with child-like fantasy at the same time. The Ghibli Dictionary is not like a normal dictionary, simply listing words in alphabetical order. 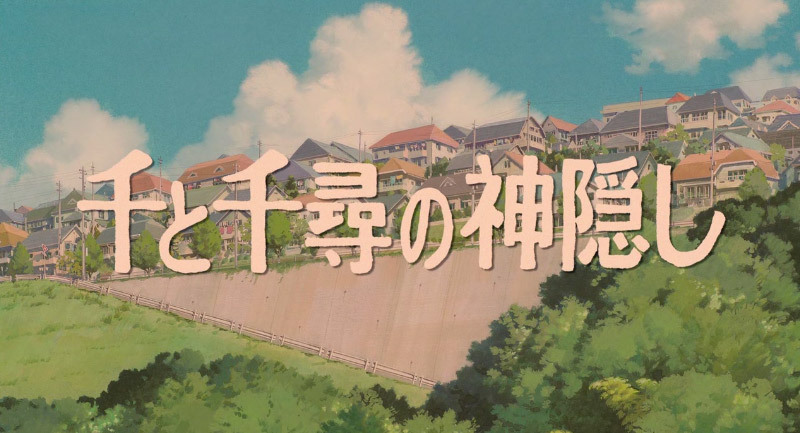 Its purpose is to teach you words that will increase your understanding of the Japanese used in Ghibli films (without subtitles, of course). The words are organized according to the films they can be found in. For each film, there is a different category of word to focus on while viewing the film. For example, the My Neighbor Totoro section focuses on nouns. In this way, you can concentrate your studies toward learning one specific aspect of the dialogue at a time, instead of trying to learn everything all at once. There are many ways to use the dictionary according to your level and preference. One way I recommend is to read over the words for the film you choose and try to remember as many as you can. While viewing the film, listen for the words you just learned and see how many you can recognize. Once you recognize them here, you’ll be surprised at how often you encounter the same words in other anime, dramas, or films. Soon, you’ll be speaking, thinking, and even dreaming in Japanese! Be advised that all the listings in the Ghibli Dictionary are in kanji, hiragana, and katakana. No romaji! Romaji, as helpful as it seems to beginners, its actually detrimental. It can make it hard for you to read real Japanese later on and wastes your study time. So if you don’t yet know hiragana and katakana (you don’t need kanji to get started in the Ghibli Dictionary), I suggest you check out Tofugu’s handy guides for learning hiragana and katakana. It will take less than a day or two to learn both, and you will be studying much more efficiently from then on. 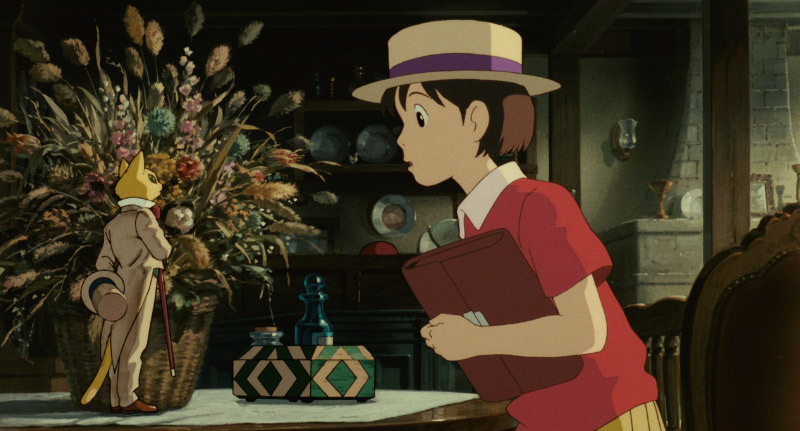 The words in the Ghibli Dictionary are listed (for the most part) in the order they appear in the films, so you can get a general idea of where to find them. Enough talk. Let’s get started! 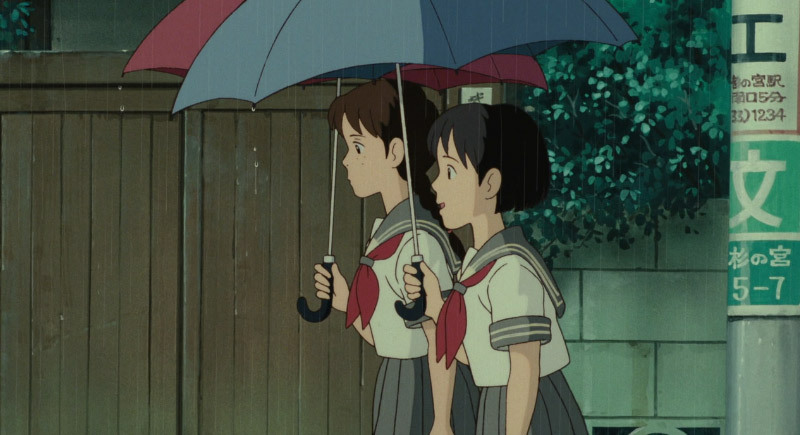 My Neighbor Totoro is a simple story about two young sisters who move with their father to a new house in the countryside. Their mother is ill and staying at a hospital nearby. Soon after moving into the new house, they meet a big fluffy creature called Totoro. 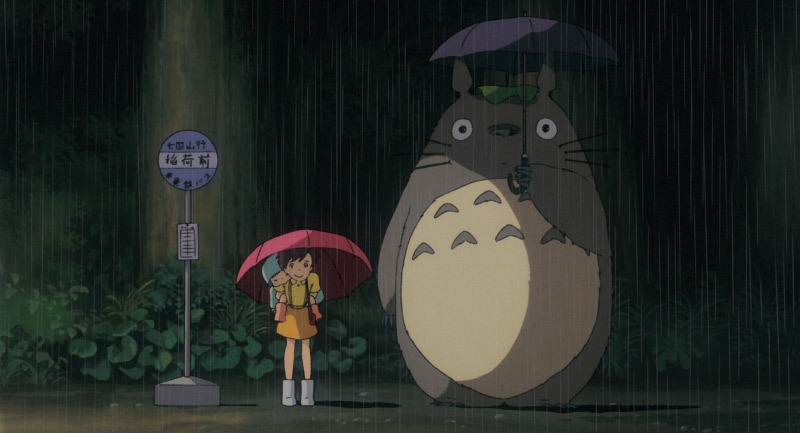 With his mysterious kindness, Totoro helps them get used to a new environment and deal with the anxiety of their mother’s illness. Since the dialogue centers around two children, Satsuki and Mei, the language is quite simple and easy to understand. If you feel ready to graduate from the annoyance of subtitles, this is a great place to start. Repetition is one of (if not the) most important aspects of language learning. 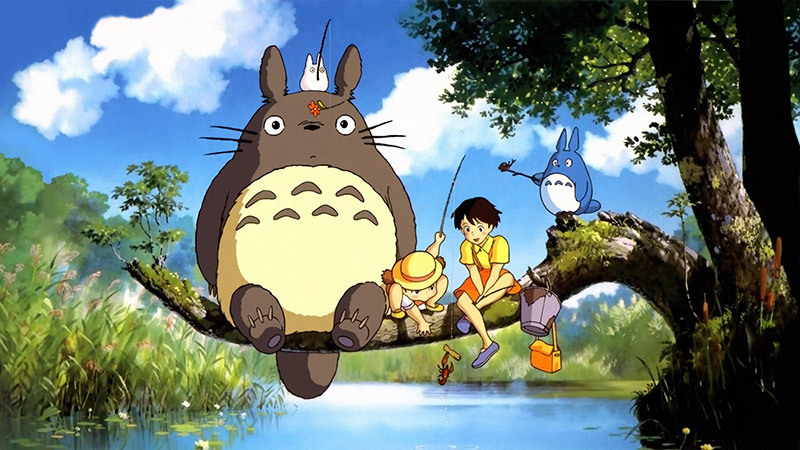 The great thing about My Neighbor Totoro is that many words are used repeatedly, as children are apt to do. 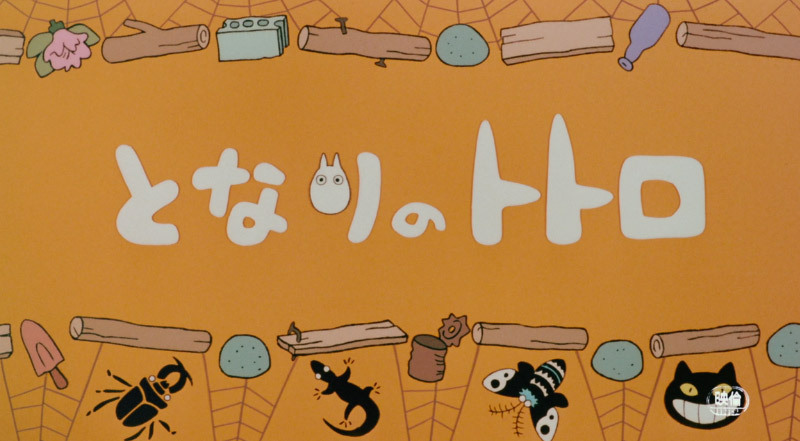 So let’s focus on learning the nouns that repeat in My Neighbor Totoro. Let’s start by learning the nouns and pronouns for people since they are the most repeated words. Sometimes words for family members are said with or without the お, and さん honorifics, and instead are replaced with ちゃん. They mean the same thing, but the お and さん are a bit more formal. The list includes the form that is used most in the film. 妹（いもうと） = Younger Sister. Unlike おねえちゃん, this word is not used to call your younger sister, but only to refer to her. In Japan, younger family members are only addressed by their names. おばあちゃん = Grandmother, Old Lady. This word is generally used for any woman who is elderly, not just your own grandmother. 私（わたし） = I, Me. Mei refers to herself as Mei instead of I or me. Young girls tend to do this but the older sister Satsuki mostly uses 私, which makes her sound more mature. みんな = Everyone. The teacher at Satsuki’s school says みなさん, which is a more formal way of saying everyone. 先生（せんせい） = Teacher, Doctor. You may be used to calling your Japanese teacher 先生, but people of many other occupations are addressed as 先生 as well, such as doctors, lawyers, or politicians. This is a list of the nouns that are repeated most throughout the film. お 家（うち） = House, Home. Satsuki’s teacher uses this word to mean household, which is also a common usage. 家（ いえ） = House, Home. This is the same word as お家 (おうち), even though the pronunciation is quite different. クスノキ = Camphor Tree. This is the type of tree that Totoro lives in. 猫（ねこ） = Cat. The cat bus is called 猫バス (ネコバス). 風邪（かぜ） = Cold (as in catch a cold). This has the same pronunciation as 風 (かぜ) meaning wind, so try not to get them confused. Mei, being as young as she is, is prone to mispronouncing words. 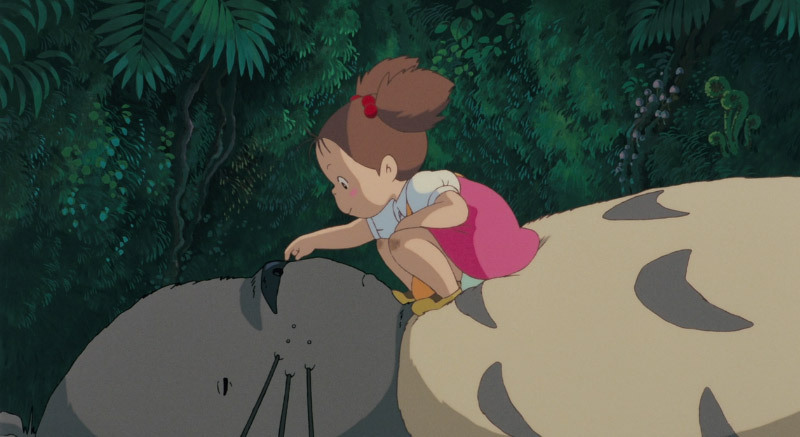 One of those words is トロル (tororu, meaning “troll”), which she pronounces as トトロ (totoro). The name of the film and the fluffy creature we all love is just Mei’s way of pronouncing troll. The other two words that Mei mispronounces are words that new learners of Japanese may have trouble with as well, so watch out. おたまじゃくし = Tadpole. 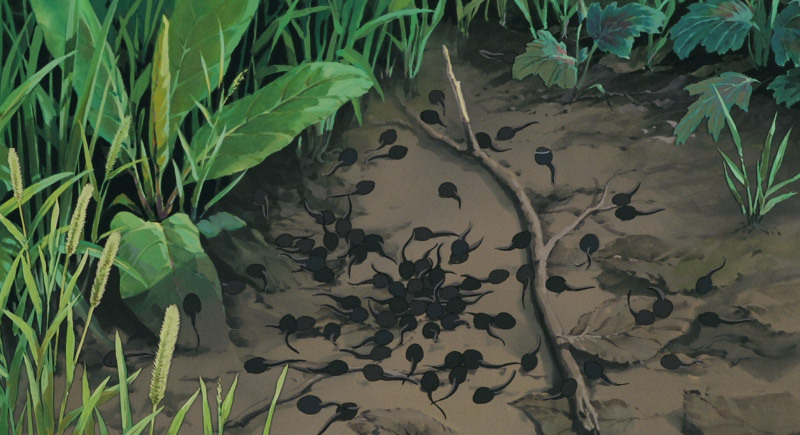 When Mei finds tadpoles in a small pond in the garden, she yells out オジャマタクシ！, an understandable mistake. 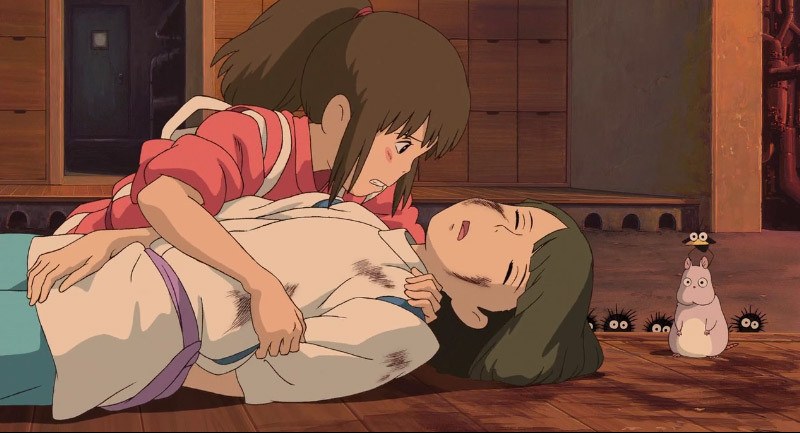 Spirited Away is possibly the best-known Ghibli film. It is the highest grossing Japanese film of all time and even won an Oscar. It is a fascinating story about a ten-year-old girl who, with her parents, enters the world of the gods. Her parents are turned into pigs and she is forced to work at a bathhouse run by a wicked witch. The colorful environment and wonderfully detailed artwork make this film a joy to watch. So what better words to learn from this film than words that describe things? Adjectives! There are a number of different adjectival forms in Japanese, but we’ll only focus on the three most common: ones that end in い (i), しい (shii), and な (na). This is the most common and basic form of Japanese adjective. These can be placed either before or after the thing it is describing. どんくさい = Slow, Slow-witted. This word is used for people who are clumsy or slow to learn. Lin calls Chihiro this in the beginning, but Chihiro becomes brave and spirited by the end, so she takes it back. うまい = Delicious, Skillful. 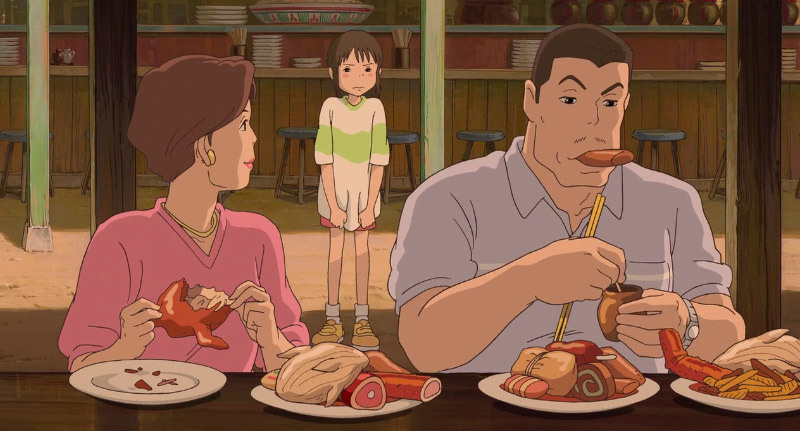 This word can be used to say food is delicious, but it can also be used generally as “good” or “well.” For example, near the end of the film, No-Face is helping make a broom for Zeniba and Zeniba says, “うまいじゃないか” to tell him that he is doing a good job. 早（はや）い = Early, Fast. This can also be written as 速い. 遅（おそ）い = Late, Slow. Even though there are two different ways to write fast and early, there is only one way to write slow and late. These are actually just a form of i-adjectives. They tend to be emotions, personalities, or states of being. おかしい = Weird, Odd. 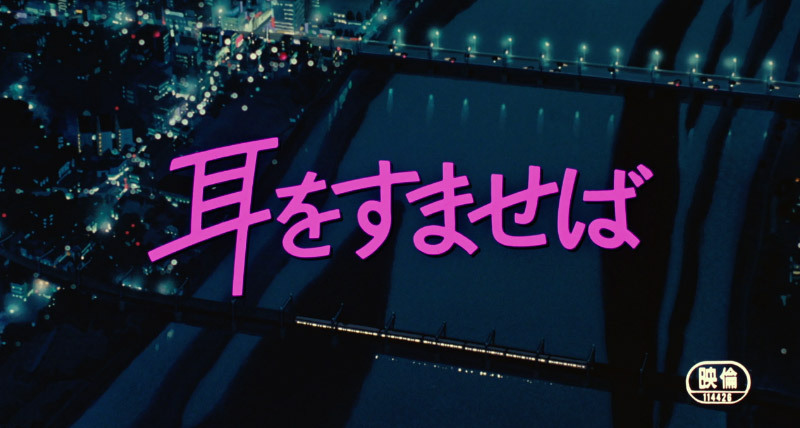 This word has other meanings such as “funny,” but in this film, it is only used to say “That’s weird…(おかしいな…). 美味（おい）しい = Delicious. The difference between “ おいしい” and “うまい” is that “おいしい” is a bit more formal while “うまい” is casual and manly. 苦（くる）しい = Painful, Strenuous. Another word with many meanings. It is used for any situation where one is having a hard time, physically or emotionally. In the film, Chihiro uses this word to ask Haku (in his dragon form) if he is in pain. These adjectives can only come before the noun. きれいな = Pretty, Beautiful, Clean. きれい can be used on its own, but adding -な at the end of きれい makes it able to modify a noun. 大事（だいじ）な = Important. だいじな and たいせつな have a similar meaning but たいせつな sounds much more important and emotional. Nausicaä of the Valley of the Wind is set in a world where most of the land is covered in toxic forests swarming with giant insects. 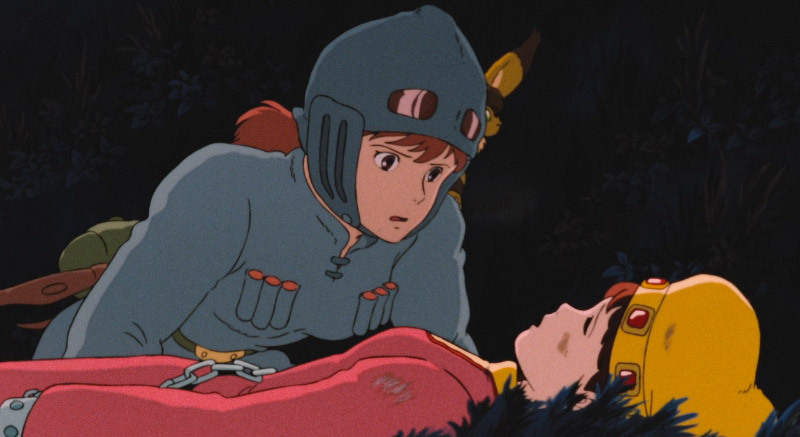 Nausicaä, the princess of the Valley of the Wind, gets caught up in a struggle with the Tolmekian army who are trying to use an ancient weapon to wipe out the insects. The story is full of suspenseful events and high-pressure moments, which means that there is a lot of ordering around going on. They just don’t have enough time to ask nicely. If your image of Japanese people is that they are extremely polite and would never tell you anything directly, well…that’s not always the case. The dialogue of this film uses an abundance of imperatives (commands) that are useful to learn for understanding your boss’s orders or picking a fight. The language of this particular film is a bit archaic, so it could be challenging to try and understand all of the dialogue. Let’s just focus on imperatives for now. These words are in the simple imperative form that could sound very rude in the wrong situations but are very useful in dire circumstances. They are useful to know when watching war movies or detective dramas. Be aware that these words are all verbs translated into forms that make them commands. Since this is a dictionary we won’t go into how these verbs are conjugated (use a textbook for that), but it’s good to know that these words are conjugated forms. 急（いそ）げ = Hurry Up. This is by far the most used word in the film, since the characters are always in a hurry. 早（はや）くしろ = Do It Quickly. Sometimes the older men say はよせい, which is the exact same word just in a different dialect. 動（うご）くな = Don’t Move. If a Japanese cop yells this at you, you might be in a bit of trouble. This form, ending in て (te) or で (de), sounds softer and closer to a request. These are words in the て form, which we won’t go into explaining here, because this is a dictionary. It’s fine to know these て form words as they are, but be sure to learn how the て form is conjugated and utilized by studying a textbook. 燃（も）やして = Burn It. 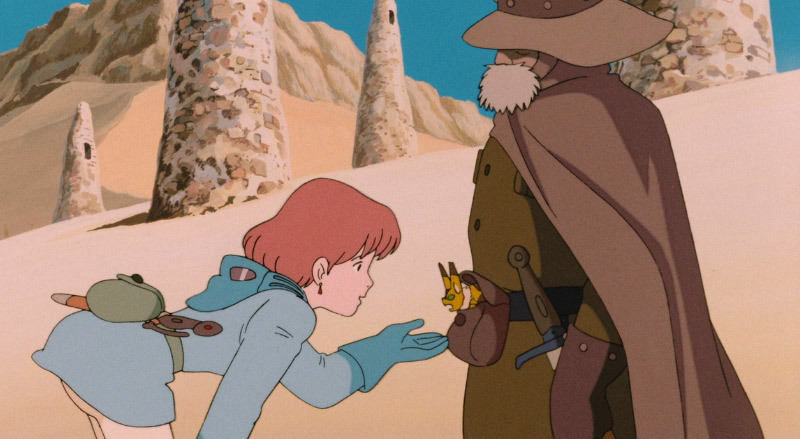 Princess Lastelle uses this word to ask Nausicaä to burn the cargo. This is a good example of the difference between the softer commands and direct orders. She does not say 燃やせ, which would have made her seem rude and stuck up. Some of the commands are given in the -なさい form, which is a softer but condescending form of the imperative. It should only be used for people who are much younger or are of lower social position than you. Parents often use the -なさい form to their children. Japanese has words that can only be said to children or animals. 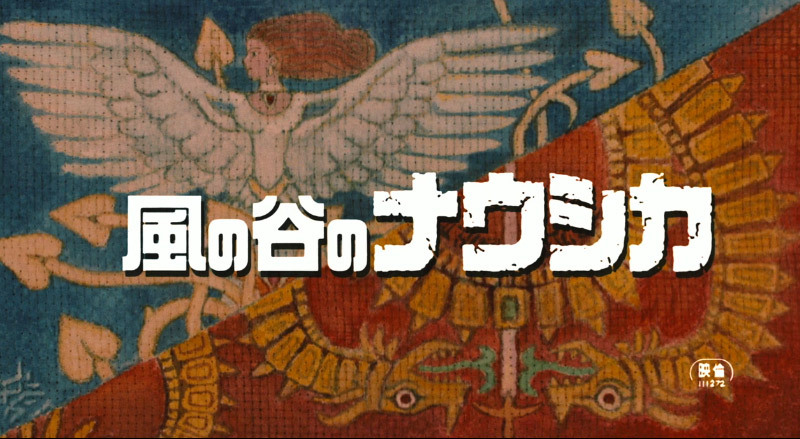 You can hear Nausicaä saying these words to the ohmu and the fox-squirrel in the beginning of the film. お 帰（か）えり = Go Back. Yes, this is the same word to say “Welcome back,” but what the speaker means should be clear from the context. おいで = Come Here. This can also be used to invite friends to your place, but it must be a very casual context or you may sound rude or condescending. 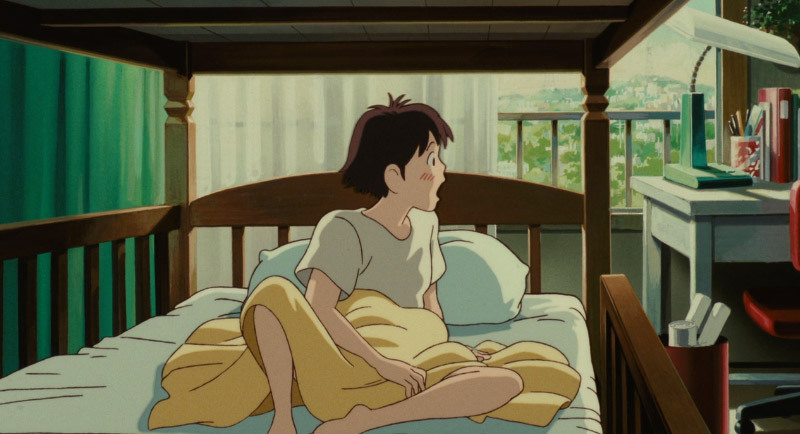 My personal favorite Ghibli film, Whisper of the Heart, is a slice-of-life story based on the manga of the same name by Aoi Hiragi. 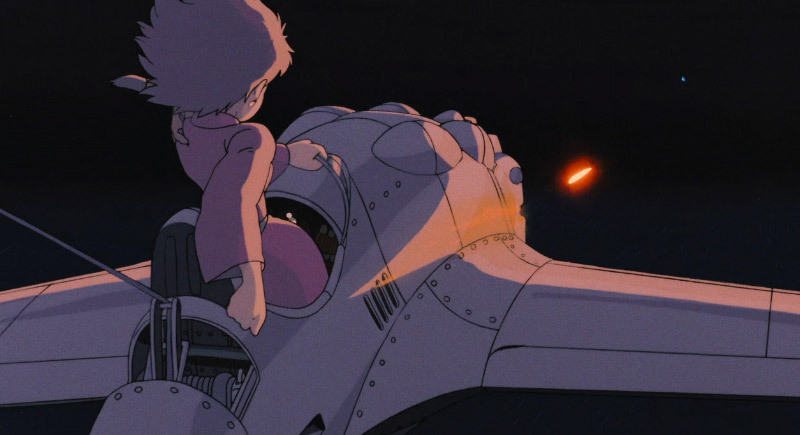 It was written by Hayao Miyazaki, but actually directed by Yoshifumi Kondō. It is about a 14-year-old girl, Shizuku, who loves to read. She keeps seeing the same boy’s name, Seiji Amasawa, on many of the library checkout cards and begins to daydream about him. One day, she meets a boy who gets on her nerves, who turns out to be Seiji Amasawa. This is a great film for learning Japanese because the language is realistic and very casual. So let’s focus on a very general type of word that covers a wide range of usages: nimoji jukugo! Nimoji jukugo are words that are made by combining two kanji characters. The meanings of the two characters are combined to make one meaning. I’ve divided the words up into four different categories so maybe you can try to tackle one or two at a time. The great thing about learning kanji words is that you can mix and match the kanji to make new words, or if you recognize at least one of the kanji, then you might be able to guess the word’s meaning. So if you are an intermediate or advanced level, try to learn the kanji as well. If you know Chinese and already recognize the kanij, well then…you’re just lucky. I probably don’t have to explain how important these words are. You can probably see some patterns in the kanji. 毎日（まいにち） = Every Day. Pretty much every word that has to do with “day” has the kanji 日 in it. 午後（ごご） = Afternoon. The word for before noon is 午前 (ごぜん). 応援（おうえん） = Support. This word can also mean “cheer” as in “cheer for a sports team,” but is only used as “support” in the film. 自分（じぶん） = Oneself. A very useful word that can be used to say myself, yourself, himself, herself, or one’s own. It can also be used in place of a first or second person pronoun, which can be a bit confusing. 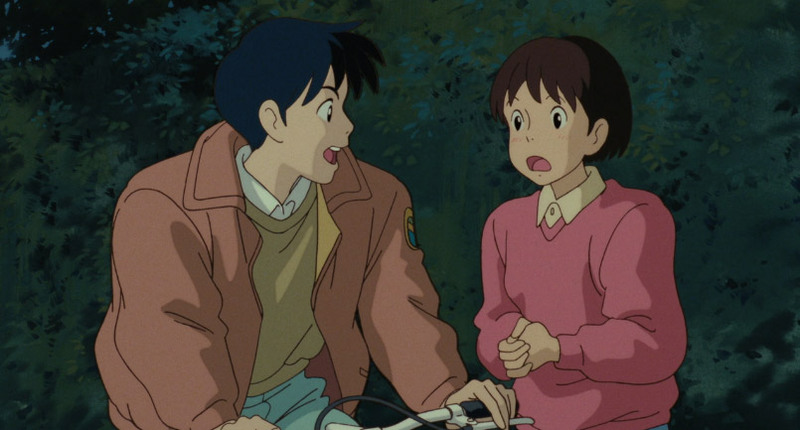 For example, when Shizuku gets angry at Seiji after finding out his name, she calls him じぶん which means “you” in this context. 進路（しんろ） = Course. In this case, the course of one’s future. 自信（じしん） = Confidence. There is another word that is pronounced じしん written as 自身. This word means “oneself,” so try not to get them confused. 全然（ぜんぜん） = Not At All, Completely. This word was originally used only for negative phrases but is now commonly used in positive phrases as well. For example, 全然食べれません means “I can’t eat at all” and 全然食べれます (ぜんぜんたべれます) means “I can definitely eat.” Keep in mind that using this in the positive form is not technically correct and is often used by young people. I hope you enjoyed using the Ghibli Dictionary and picked up a few words to add to your vocabulary. By the end of studying these four movies, you will begin to recognize the words and structures of dialogue. Once recognition kicks in, understanding will naturally follow. Animation, and films in general, are a great resource for learning Japanese. But without a clear goal or method, it can be ineffective and take a very long time. I hope this guide gives you an idea of how to use film as study material. I would love to hear about your experience of studying with the Ghibli Dictionary. Whether it was helpful or useless, loved it or hated it, want more of it or have suggestions on how to change it, please leave all of your thoughts on Twitter. 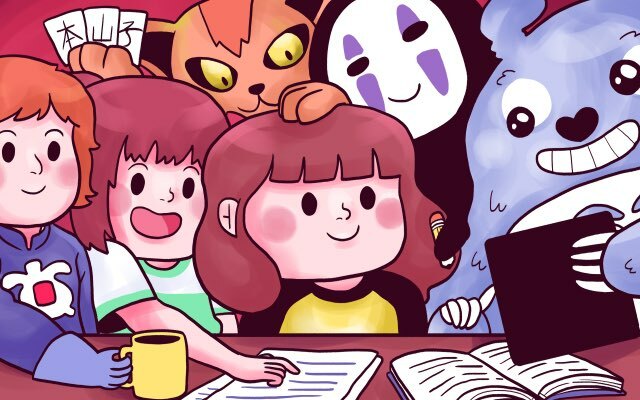 Your feedback would be invaluable in further developing the Ghibli Dictionary and The Study Guide Revolution!